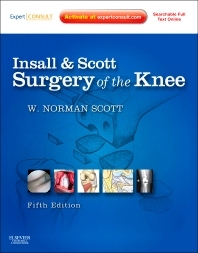 Online and in print, Insall & Scott Surgery of the Knee, edited by W. Norman Scott, MD, and 11 section editors who are experts in their fields, is your complete, multimedia guide to the most effective approaches for diagnosis and management of the full range of knee disorders affecting patients of all ages. From anatomical and biomechanical foundations, to revision total knee replacement, this authoritative reference provides the most up-to-date and complete guidance on cutting-edge surgical procedures, the largest collection of knee videos in one knee textbook. Expanded coverage and rigorous updates—including 40 online-only chapters—keep you current with the latest advances in cartilage repair and regeneration, allograft and autografts, computer robotics in total knee arthroplasty, and other timely topics. This edition is the first book ever endorsed by The Knee Society. Access the full text - including a wealth of detailed intraoperative photographs, a robust video library, additional online-only chapters, a glossary of TKR designs, quarterly updates, and more - at www.expertconsult.com. See exactly how it’s done. Watch master surgeons perform Partial and Primary TKR, Revision TKR, Tumor Replacement, Fracture Treatment, and over 160 videos on the expertconsult.com.